There will always be those of us who are far more comfortable with a bottle of Rimmel than anything else, whether that’s down to budget constraints or personal preference, and there are some great dupes to be found on the high street if you know where to look. But for when your skin really deserves a treat, or you have needs that a Superdrug multibuy deal just can’t provide for, the best high-end foundations are where it’s at. A common complaint around high street foundations is their lack of provision for dark skin – the foundation with the biggest shade range on our list is Hourglass Vanish Seamless Finish Foundation Stick, which is available in over 30 shades and offers amazing coverage. Those with acne-prone skin whose sensitivities can be made worse by some synthetic ingredients can look to the Argan Liquid Gold Multi-Tone BB Cream, which not only uses organic argan oil to soothe and smooth, but adapts to individual skin tones to take the guesswork out of shade-matching. Nice one. There are also foundations for oily skin, foundations for dry skin, and foundations that just plain look amazing, so keep reading below to find your perfect fit. The new foundations show that high coverage needn’t mean a mask-like finish that you need white spirit to get off at the end of the day, and this Giorgio Armani offering is a prime example of the full-coverage foundation par excellence. Testers found that it covers beautifully but doesn’t mask the skin, leaving it glowy and full of life, and also that it doesn’t cling to flaky dry patches as so many long-wearing foundations can. They also found that you could get away with applying very little product and still being able to buff out to a perfect base, which gets double points on the economical front too. Packed with proven skin-soothing ingredients like aloe, chamomile and arnica, and outrageously healthy-sounding ones like rosemary, green tea and rice bran, this Chantecaille foundation might seem like the equivalent of a green smoothie for your face, but it’s really nothing more complex than a fantastic base for combination skin. A clinical trial showed a reduction in sebum production after seven days of use, but testers say the oil-free formulation doesn’t come at the cost of dry areas feeling parched and tight, proving that a flawless finish can be accessible to even the trickiest of combination skins. Testers adored the weightlessness of this long-wear liquid foundation, saying it gives great coverage without compromising on how it feels on the skin – that is, positively dreamy. Reviewers said it had a beautiful velvety texture that perfects but doesn’t mask skin, and those in search of an undetectable finish were especially impressed. Fans of the original La Mer foundation will need to be careful which shade they repurchase, as they’ve been given an overhaul along with the new formulation, but with over 20 to choose from, most skin tones should be able to take advantage of the beautifully natural finish. Some of us have skin tones that are just more difficult to match than others, so to save your hands from being permanently patchworked with swatches, a BB cream that adapts to your skin colour might just be the answer you’re after. This Multi-Tone BB Cream from Argan Liquid Gold isn’t – as you might have guessed – strictly a foundation, but for acne-prone skin that’s looking for light, perfecting coverage, it comes highly recommended. The inclusion of 24-carat gold might seem a little gimmicky, but combined with the gentle, hydrating action of organic argan oil, testers found it beautifully illuminating. For warm-toned skins, it’s a winner, if there’s room in the budget. Is there such a thing as a no-foundation foundation? If so, Chanel seem to have pinned it down with Les Beiges. Those who don’t like the feel of heavy makeup on their skin are sure to love this one, as testers have commended it for its fresh, light application, reporting that it goes beyond regular claims of weightlessness, actually feeling as if they’re wearing nothing at all. While it’s not one for skin that needs a lot of coverage, and you’ll likely want a dab of concealer on any noticeable imperfections, if you’re after that intangible lit-from-within look, you’ve got it. Our best powder foundation comes courtesy of Bobbi Brown, in the form of this weightless sheer-coverage powder. Testers found that its light texture made this powder perfect for setting as well as for use as a base by itself, with far less risk of looking cakey than the average powder compact. Its mattifying characteristics make this foundation a good one for users with oily skin, who don’t need a lot of coverage but still want the benefit of a long-lasting finish. Its longevity means that the need for re-applying should be minimal, although the good-looking compact means you shouldn’t feel shy about whipping it out for touch-ups. 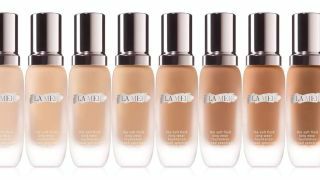 Stick foundations have come on leaps and bounds in recent years, and have earned legions of new fans with high-tech formulations, as in this amazing full-coverage foundation from Hourglass. Unlike many of its twist-up brethren, reviewers said it didn’t feel too heavy on the skin, but that it still had that same sumptuously creamy consistency that makes it so easy to work in and blend to a flawless finish. It’s even waterproof, so all that time spent blending won’t be wasted the moment the heavens open. And, with over 30 shades, it’s also our biggest colour range – talk about multi-talented!